Are you looking for Jack Daniel’s glaze? Well, you’ve come to the right place. This is that stuff you enjoyed from the TGIFridays menu, only BETTER. This is great on steak, chicken, shrimp and burgers! Combine all glaze ingredients in a medium size saucepan. Simmer until slightly thickened over medium-low heat for about 5 minutes. Stirring frequently with a wire whisk. If you enjoy the Jack Daniel’s selections on the TGI Fridays menu, then I think you’ll thoroughly enjoy this Jack Daniels Tennessee whiskey glaze. It’s SO good! It’s a great alternative to barbecue sauce! YUMMMMMM!!!!!! I love this stuff and I have been looking for it forever!!! I was just wondering how long would this keep in the fridge?!!! THANK YOU FOR POSTING!!!! Hi Sahnnon! this will keep at least two weeks in the refrigerator 🙂 thanks for asking, I should go into this post and include that information. Enjoy the recipe! This looks wonderful! How long does it keep? Hi Irene! We’ve loved this sauce for sooo long….never thought we could make it at home. Thanks so much. Friday’s sauce has tiny chopped onions. Do you think those are added during the cooking process, or after? Could this recipe be poured into sterilized jars, water bathed, and shelf stored un-opened for a period of time, given as a gift, with a note saying “Once opened, store in refrigerator – good for two weeks.”??? I believe it could, Donna! would that be good for salmon glaze? Could we omit the bacon drippings? Or sub it for something else? I’ve never tried subbing something else for the bacon drippings, but you can certainly try. Made this with Honey Jack Daniels for goose and duck breasts on the bbq, wow! We loved this sauce as well, having changed to cleaner eating, removing overly processed food TGIF’s has been out for a while. What would be a good substitute for the Steak Sauce? Love your blog! This stuff is so good! I use it on steaks and chicken for the most part. I ran out of Jack so I had to improvise a few weeks ago and all we had was Wild Turkey. It’s a different flavor but still so good! Does this flame (catch on fire on the stove) to burn off the alcohol? Thankfully out of all the times I’ve made it the alcohol has never caught fire. It’s just smells very strong for a few minutes as it heats up. Can you substitute those bacon drippings for something else? I am vegetarian. sure you can, Vanessa 🙂 Use your favorite oil. 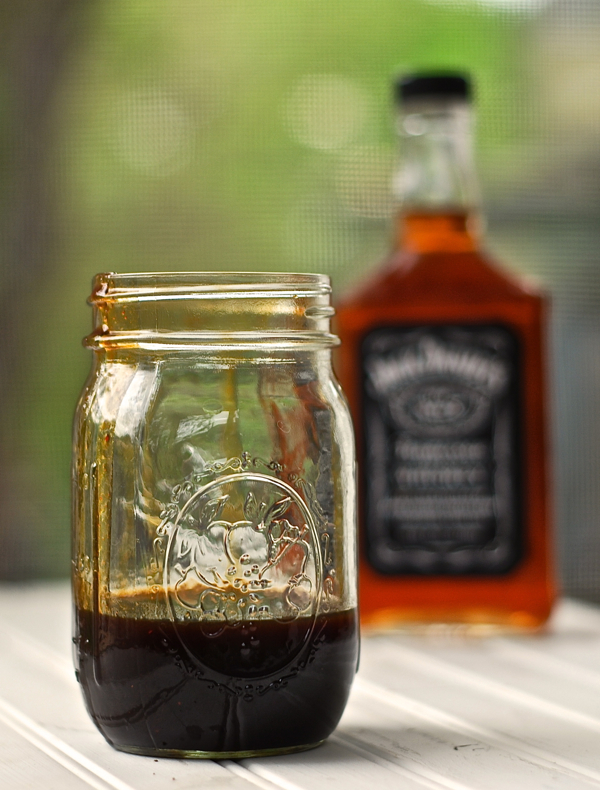 I love sipping Jack when I BBQ so I can just imagine how wonderful this will be on some ribs. hi! Was thinking of making this tonight with chicken. I was going to make up the glaze and then add it to chicken breasts and cook in the crockpot. Would that work? Hello Melissa, I can’t find the chipotle powder where I live (very small town). Can you recommend something else–maybe smoked paprika/chili powder mixture? oops! I already suggested that in the original recipe. 🙂 yes, smoked paprika and chili powder would be a good substitute. Enjoy! Have you tried it on beef ribs, looking to kick my beef ribs up a notch. Yes, we’ve used this on beef ribs a few times and it’s amazing! Thanks for stopping by. Enjoy! what is the best way to can? This would be my first time canning. I am making a seasoning and glaze crates for family members for Christmas. Thanks! I cannot wait to make this! Thank you for sharing! Pingback: August 12-2018 Newsletter - Gina Rae Mitchell Sign Up Today!